"Corn tortilla strips in a chicken broth seasoned with tomatoes and pasilla chile. 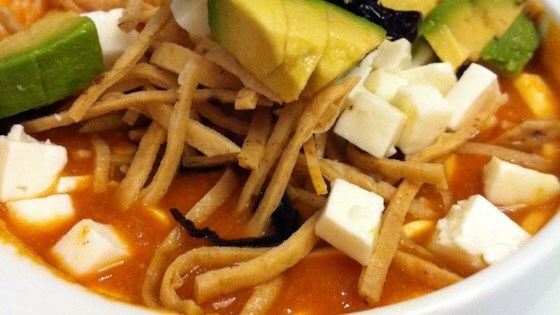 An authentic Mexican soup served with avocado, Mexican cheese, and crema." Heat oil in a large pan or wok over medium-high heat. Add tortilla strips in batches and fry until brown and crispy, 2 to 3 minutes per batch. Remove from heat and drain on paper towels. Fry pasilla chiles in the same pan, being careful not to burn them, until browned, about 2 minutes. Remove from oil and drain on paper towels. Combine 1 fried pasilla pepper, tomatoes, onion, garlic, and oregano in a blender; blend until smooth. Strain through a sieve into a bowl. Heat 1 teaspoon oil in a saucepan over medium heat. Add tomato mixture and cook for 2 minutes. Pour in water and bring to a boil. Stir in chicken granules and parsley. Cover and simmer over low heat until flavors are well combined, about 15 minutes. Remove from heat and discard parsley. Divide fried tortilla strips among 4 bowls. Pour soup on top of tortilla strips and garnish with diced avocado and cotija cheese. Cut remaining fried pasilla peppers into thin strips and sprinkle over soup. Add Mexican crema to each bowl. You can substitute dried pasilla chiles with ancho or cascabel chiles. If using cascabel chiles, triple the amount. Excellent flavor! I made it exactly as directed.